Democrats on the House Judiciary Committee grilled Acting Attorney General Matthew Whitaker repeatedly about his relationship to Robert Mueller's Russia investigation during Friday's hearing. The former chief of staff to AG Jeff Sessions was frustrated by the repetitive inquiries and even clapped back at the representatives. He even quipped at Chairman Jerrold Nadler (D-NY) at one point that his "five minutes was up." Rep. Jim Jordan (R-OH) did not press Whitaker about his thoughts on the Russia probe, but he shared his concerns about another controversy. And he wanted answers. On Aug. 2, 2017, the DOJ released a largely redacted memo revealing that Deputy AG Rod Rosenstein allowed Mueller's team to investigate President Donald Trump's former campaign chairman Paul Manafort to determine if he was "colluding with Russian government officials" in the 2016 presidential election. 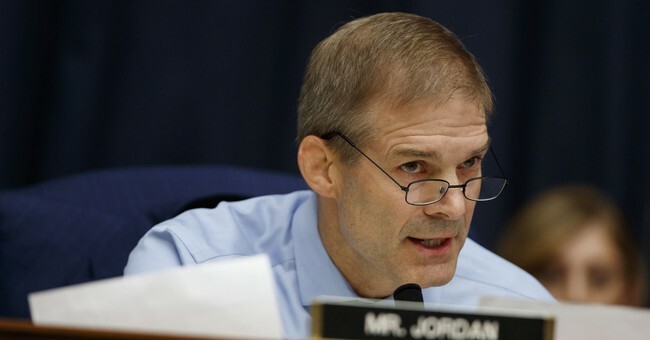 Jordan recalled how Rosenstein “got all huffy” with him when he asked him if there were other “specific individuals” mentioned in the memo. So, he tried to ask the same question of Whitaker. They at least came to an understanding that "in this country, we don't investigate people, we investigate crimes."